The North Carolina Whig, a newspaper published in Charlotte in the 1850s and 1860s, is now available on DigitalNC as part of the North Carolina Newspapers collection. 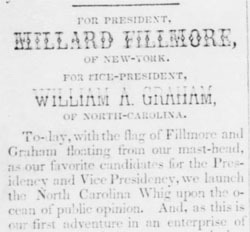 Fillmore’s efforts to remain in office fell short when he failed to receive his own party’s nomination, but the North Carolina Whig lived on, publishing at least until 1862. The North Carolina Whig was nominated for digitization by the Charlotte Mecklenburg Library. Visitors to the North Carolina Yearbooks collection today will find a new and improved design. The new look makes it easy to pick the school you’re looking for from a list or by typing the name, and includes recent highlights from yearbooks on the North Carolina Digital Heritage Center’s Flickr collections. The biggest change is that there are now links at the top of the page to two important sections of the site: College and University Yearbooks and the recently-launched High School Yearbooks (more about this soon). Enjoy, and let us know what you think. Student yearbooks from Richmond Community College are now available on DigitalNC in the North Carolina Yearbooks collection. 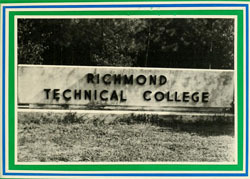 The college was established in 1964 as Richmond Technical Institute, later changing its name to Richmond Technical College before becoming Richmond Community College in 1987, when the school joined North Carolina’s community college system. There are 17 volumes of the Valiant now available online, ranging in date from 1970 to 1986. The original yearbooks are held by the J. Richard Conder Learning Resources Center at Richmond Community College. 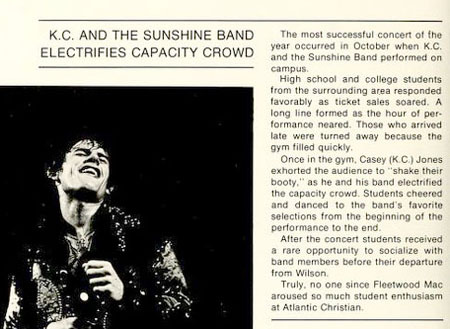 The 1977 edition of The Pine Knot, the yearbook from from Atlantic Christian College, gives an interesting glimpse into the musical tastes of students at the small school in Wilson, N.C., at the time. 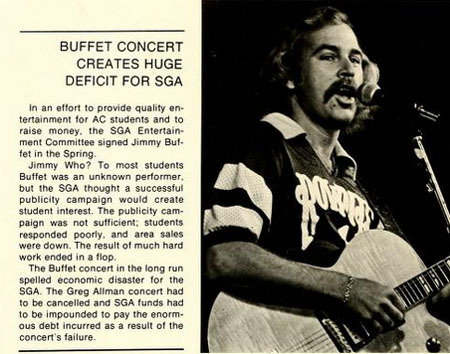 The Student Government Association thought they had a sure hit on their hands when they booked the now widely-popular Jimmy Buffet to play a concert. Apparently they were ahead of their time. So if there weren’t too many Parrotheads on campus in the 70s, what kind of music did they like? Yearbooks from Atlantic Christian College (now Barton College) are now available in the North Carolina Yearbooks collection on DigitalNC. Student yearbooks from Atlantic Christian College and Barton College in Wilson, N.C., are now available on DigitalNC as part of the North Carolina Yearbooks Collection. Atlantic Christian College was founded in 1902 by the North Carolina Christian Missionary Convention and is affiliated with the Christian Church (Disciples of Christ). In 1990, the school name was changed to Barton College in honor of Barton Warren Stone, a founde of the church who was active in eastern North Carolina. The yearbooks available online span the years 1910 through 1994. The original volumes are held by the Hackney Library at Barton College. Big news for alumni of public universities in North Carolina: student yearbooks from all 15 University of North Carolina system universities are now freely available online. Yearbooks for 14 of the schools have been digitized by the North Carolina Digital Heritage Center and are available in the North Carolina Yearbooks collection on DigitalNC, while yearbooks from North Carolina State University are available through the excellent Historical State digital collection. These yearbooks are terrific resources for students and alumni, as well as anyone interested in the evolution of higher education and student life in 20th-century North Carolina. There are a total of 774 volumes available from these schools, ranging in date from 1890 (The Hellenian, at UNC-Chapel Hill) to the present (three UNC schools have their 2010 yearbooks available here). Student yearbooks from Western Carolina University are now available on DigitalNC. Ranging in date from 1918 to 2005, the online collection includes 73 volumes. The yearbooks are from the Special Collections department in Hunter Library at Western Carolina. Western Carolina has many well-known graduates, but I was surprised to learn, when working on the yearbooks, that author David Sedaris, originally from Raleigh, briefly attended the school. 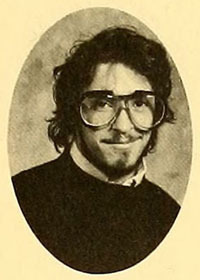 He didn’t graduate, transferring to Kent State after a year or so, but he did stick around long enough to get his picture in the 1976 edition of The Catamount (p. 239). And it’s quite a picture. 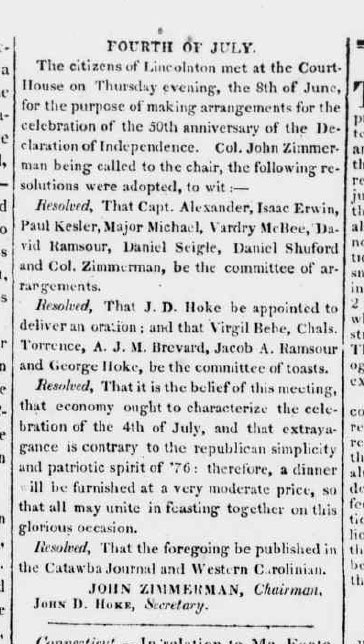 After the meal, “the cloth was removed, the following toasts were drunk, accompanied with discharges of cannon.” They drank a total of 24 toasts, lauding the leaders of the Revolution (including John Adams and Thomas Jefferson, both of whom would die on that day), the Army and Navy, the state and federal constitutions, “State Rights,” “Political and Religious Tolerance,” the University of North Carolina (“The pride and ornament of the State”), and the county of Mecklenburg. Here’s the full list. If you’re going to a party tomorrow, I’m sure you’ll want to consider printing out a copy and impressing your fellow guests with your historically-accurate salutes.